In 1915, penniless orphan Eleanore “Lora “ Jones is sent from war-torn London to the uber-posh boarding school of Iverson in peaceful Wessex. But Lora is different from the other girls, and not just because they’re daughters of the peerage and she’s a charity student. She hears music from the sky and the stones, and dreams of turning to smoke. 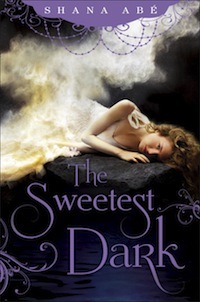 And at Iverson, her true nature will be realized – along with a connection to two boys, one fair, one dark, and both as far from human as she is. It’s turn-of-the-century London, and strange things are afoot: murders, robberies, and a conspiracy involving the Crown Jewels, the floating mineral cavorite, and a mysterious weapon. 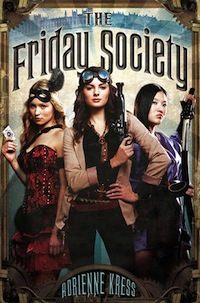 Luckily, three teenage girls are on the case: tech-savvy Cora, who works for a steampunk inventor; beautiful Nellie, a flamboyant Magician’s assistant; and serious Michiko, fight assistant and samurai in training. With the three of them working together, no villain stands a chance. Cassandra prides herself on being ready for anything, but she’s not ready for the Symphony of Smells – a strange chest full of vials that once belonged to a magician, and that appears one day at her grandfathers’ antique shop. With her new friend Max-Ernest, Cass investigates the magician’s disappearance – and finds herself battling an ancient society, the Midnight Sun, that is seeking the key to immortality. Soon Cass and Max-Ernest join the benevolent Terces Society along with their new friend Yo-Yoji, but the plots of the Midnight Sun grow ever more diabolical, and the mysteries surrounding our heroes grow ever more complex. Nimira left her home of Tiansher hoping to find fame and fortune in Lorinar, only end up a singing “trouser girl” in a low-class show. Then Hollin Parry, a well-to-do gentleman sorcerer, invites her to create a show with him, singing to accompany his fairy-made automaton piano player. Nim jumps at the chance — but when she arrives at his estate, she learns that it’s haunted by the ghost of his wife, and that there’s something strange about the automaton… In fact, it might just be alive. Genre: Athletics sociopolitical crime drama? Also, Shakespeare fanfic again. Summary: When Otello, a black soccer player in a racially-divided unnamed South American country, and pop star Desmerelda meet, it’s love at first sight, but the machinations of Otello’s two-faced agent Diego may destroy them both. The jealousy thing is basically suggested and then dropped – Otello refuses to take the bait, which makes him a much more likable character than Othello. But then what happens is that Diego murders a street kid named Bianca and implicates Otello in it; charges are dropped, but Desmerelda leaves him and both of their careers are ruined. Diego gets off scot-free. All of which sort of seems to miss the point of Othello, to my way of thinking – but then, I hate Othello, so maybe that’s a good thing? What really bothered me was that while Desmerelda is much pluckier than Desdemona, walking out on Otello to protect herself and her child, Emilia – pretty much the only character I like in the original, and in many ways the HERO – is silent for the entire book, and it turns out to be because she’s SOME KIND OF LIZARD. 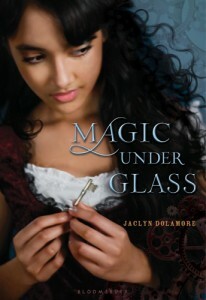 And Bianca’s a none-too-bright tween who gets murdered and her killer is never brought to justice. So of the three female characters brought over from the play (the only other major female character, street kid Felicia, never does anything of note), one is a victim and one is A LIZARD. Not a brave woman who exposes the villain and restores justice to the setting, but A LIZARD. Can you tell I’m mad? Summary: Talibah finds herself trying to unravel ancient Egyptian intrigue in order to put the souls that are haunting her to rest. Thoughts: I liked the entirely non-white cast, the pluckiness of the little brother, and the solid grounding in history and Egyptology, but otherwise this book wasn’t very good. The prose was weak, and the resolution of the mystery – the explanation of how the modern characters were connected to the historical ones – was incoherent. Having returned Jealousy to the box of evils she accidentally opened last month, Pandora heads off to find the next plague: Vanity. 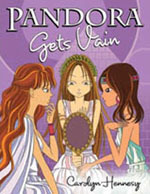 Accompanied by her best friends Alcie and Iole, her faithful dog Dido, and their hunky new bodyguard Homer, Pandora travels to Alexandria, Egypt. But even if she can master the language, avoid the mummies, and break Vanity’s grip over the 10-year-old Queen Cleopatra, can she survive the traps the goddess Hera keeps laying in her path? Percy Jackson is about to get kicked out of school…again. He doesn’t mean to get in trouble, but it follows him everywhere and he just doesn’t know why. At least not until he finds out the teacher who’s always hated him is one of the Furies, and his friend Grover is actually a satyr, sent to protect him. Soon Percy discovers that all of his troubles happen because he’s the son of a Greek god, and he finds himself first surrounded by other half-human kids like him and then out on a dangerous quest to recover Zeus’s stolen lightning bolt. And if he fails, it means war among the Gods—and probably the end of the world as we know it. Since returning to Ferryport Landing, now under the control of Mayor (Queen of) Heart(s) and Sheriff Nottingham, Sabrina has thrown herself into the business of being a Grimm with a will. But when their latest case causes rips in time to start opening up over town, that business seems even more dangerous than usual. Sabrina and Daphne find themselves on the other side of one of those rips, in a dystopian future where their very survival is in question. Can they get back to their own time and solve the case before they’re left with no future at all? 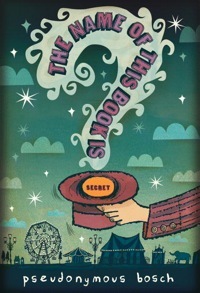 I found that I couldn’t really discuss my reactions to this book without talking about the various twists and turns the plot makes in some depth, so beware: there are major spoilers behind the cut, and they are not hidden behind a spoiler tag. You have been warned.